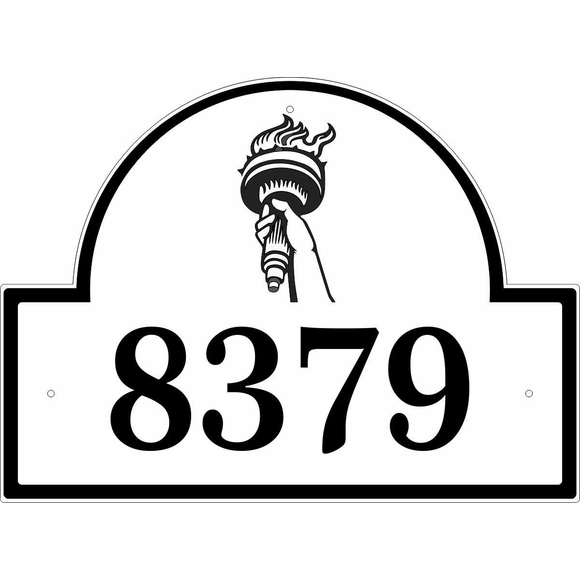 Statue of Liberty Address Plaque - - personalized house number sign. Arch shape wall-mount address plaque includes an engraved icon of the Statue of Liberty inside the arch. Made in USA. Two sizes: 12"W x 9"H (shown in large image) and 16"W x 11.75"H (shown in small images). The larger 16" x 11.75" sign can hold three (3) 5", five (5) 4", or six (6) 3.5" house numbers. If you need more than four numbers (or want large 4" or 5" numbers), be sure to pick the 16" x 11.75" size sign. Three choices for the Statue of Liberty icon: half statue, torch only, or full statue. Uniquely American patriotic plaque for a home, office, or business. Image at top, address numbers, and border are permanently engraved into the sign during the production process not just printed or silk screened on. Dimensions: 12"W x 9"H x 1/8" or 16"W x 11.75"H x 1/8". Laminated acrylic address plaque crafted in the USA by skilled artisans to assure the highest quality. The Statue of Liberty is a figure of a robed woman representing Libertas who was a Roman goddess. In her left hand she carries a book inscribed in Roman numerals with "JULY IV MDCCLXXVI" (July 4, 1776), the date of the U.S. Declaration of Independence. A broken chain lies at her feet and she holds a torch above her head with her right hand. The statue was a gift of friendship from the people of France to the United States and is recognized as a universal symbol of freedom and democracy. The Statue of Liberty was dedicated on October 28, 1886.